Swarming is the natural way that honey bee colonies reproduce. The process is triggered by a number of factors – overcrowding and diminishing levels of queen pheromone being two of the most important. Both these are, directly or indirectly, measures of how strong the colony is. If the queen has nowhere to lay because the box is wall-to-wall brood or stuffed with nectar, the colony is effectively overcrowded. In contrast, if the colony has ample space but there are so many bees that the queen pheromone is ‘diluted’, the colony will sense this indirect measure of strength and make swarm preparations. 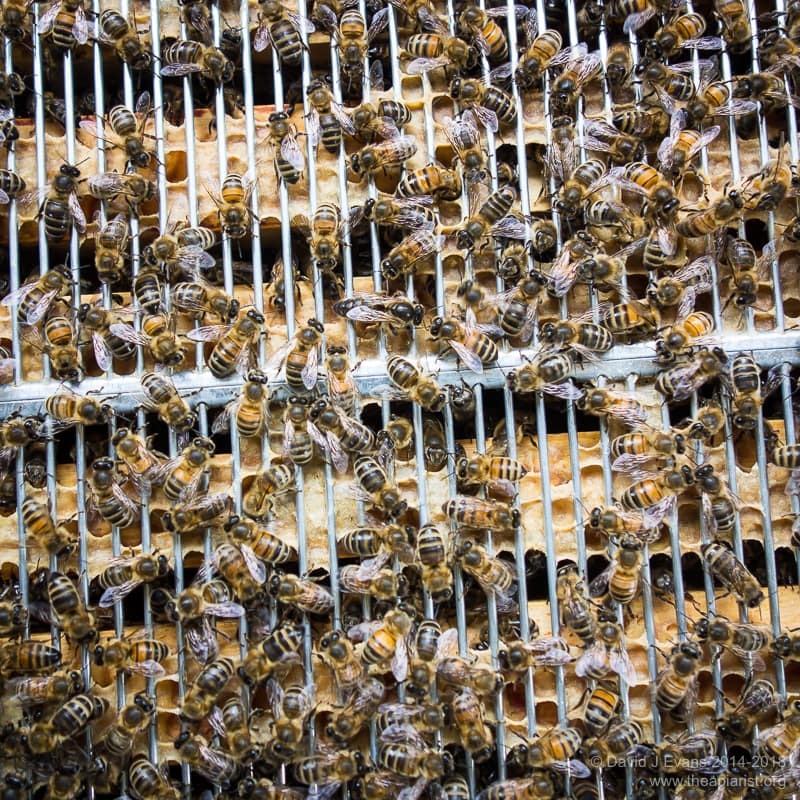 In addition, as queens age they naturally produce less queen pheromone; colonies headed by older queens are therefore more likely to swarm than those headed by first year queens. You’ll see two definitions of prime swarms. Some define it as the swarm headed by the mated, laying queen and others use it to mean the first swarm to issue from a hive. They’re usually one and the same thing. Developing queen cells in the hive are capped on the 9th day after the egg they contained was laid. 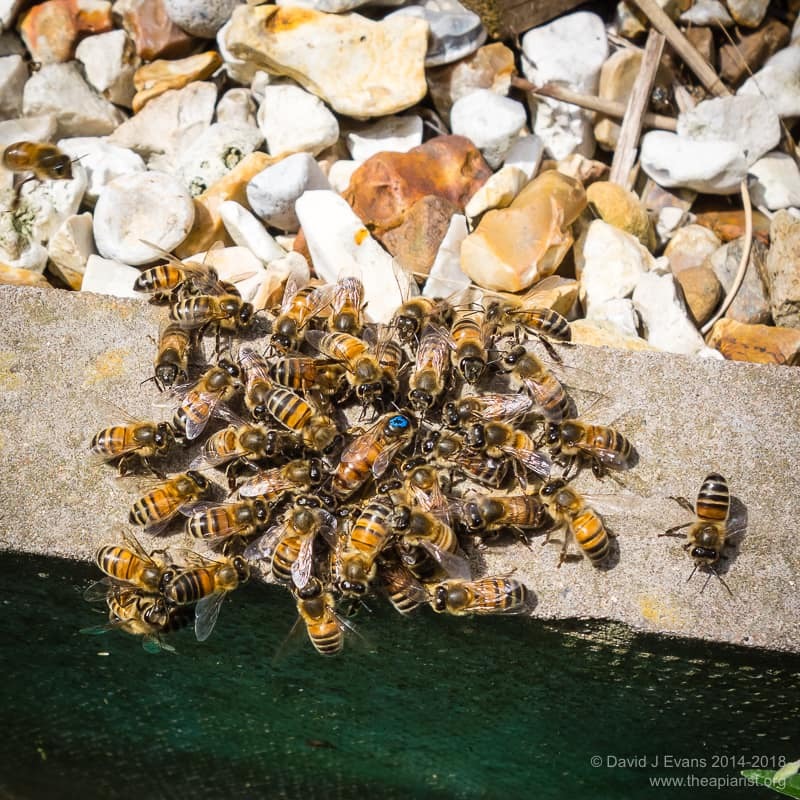 If the weather conditions are suitable – typically early afternoon on a warm, sunny day – the mated queen leaves the hive with up to half the workers. Seven days after the queen cells were sealed the new, virgin queen emerges (or ecloses). For the continued viability of the original colony this queen needs to be mated and return to the colony. She does this on a warm, sunny day a few days after eclosion. However, there are often several developing queen cells remaining in a hive after a prime swarm disappears over the fence to the howling wilderness†. All sorts of things can happen at this point. If the colony is strong enough it will throw off one or more casts. These are small swarms, headed by a virgin queen. Small is a relative term. They’re small in comparison to a prime swarm. Once started a colony can continue to throw off smaller and smaller casts. Some are these small in comparison to a mug of tea. 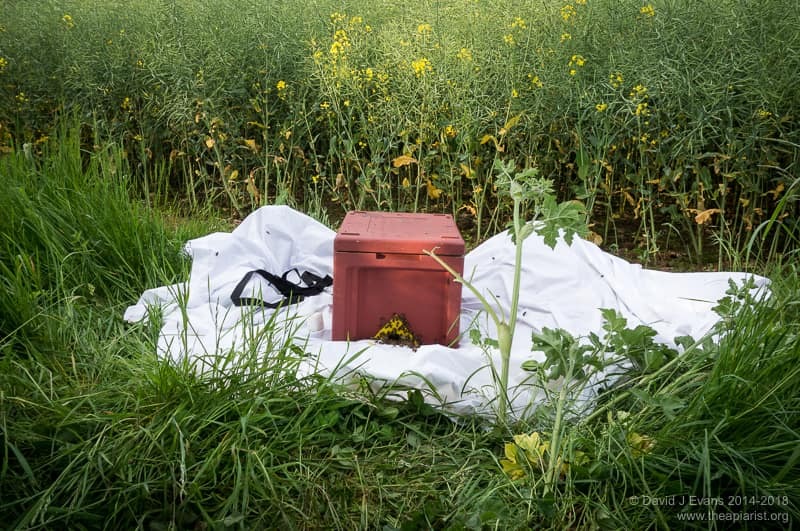 The continued loss of bees means the colony may effectively ‘swarm-out’, reducing in strength until perhaps only 10% of the original colony remains. If this happens any opportunity of a honey harvest is also lost and there’s a chance the colony will not recover sufficiently in time to overwinter successfully. To complicate matters further, if multiple queens emerge casts can contain more than one queen. Sometimes you’ll open a hive at the same time as multiple queens are emerging. It can be bedlam trying to catch half-a-dozen virgins scuttling around a busy brood box. Large casts – perhaps football-sized – are worth catching and dumping into a nuc. Once the queen gets mated they can develop into a worthwhile colony. Ted Hooper describes ‘rescuing’ smaller casts by uniting them over a queen excluder on top of the supers on a strong hive. The bees unite and the queen is prevented from entering the hive by the excluder. I’ve not had to do this. I’ve lost one or two colonies that swarmed out but missed the ever-diminishing casts altogether. 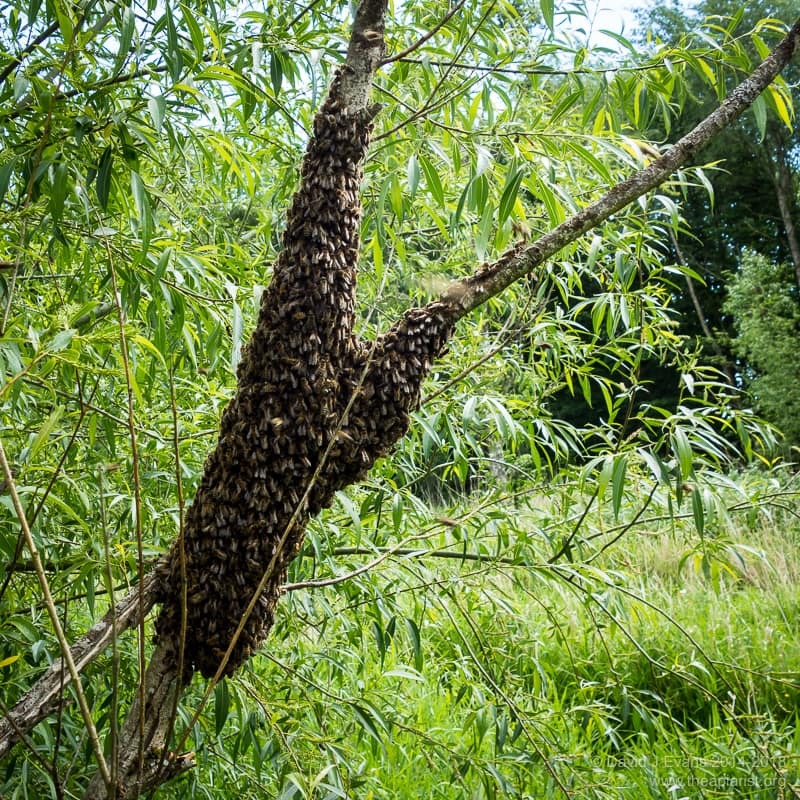 The cast swarm‡ above was collected in a skep and allowed to settle for a few hours. When I lifted the skep from the sheet to dump the bees into a nuc there was a single bee corpse remaining … a dead queen. The cast obviously contained at least two queens. On checking the nuc a week later, after a week of almost continuous rain, I found a single skittish queen running around. Her behaviour suggested she hadn’t yet had an opportunity to get out and mate. And the answer is … ? Consider again the original question … “can a prime swarm be led by virgin queen if [the] old clipped queen dies trying to lead a swarm?”. The answer isn’t necessarily straightforward. I think I’d argue that a swarm led by a virgin queen, despite being the first swarm to leave the hive, is not a prime swarm. It’s viability still depends absolutely on the virgin getting mated. I would consider it as a cast. Clipped queens have one wing trimmed to restrict their flight. 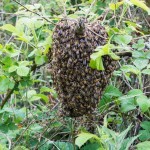 This is a well-established method of swarm control. If the colony swarms the queen drops to the ground and the swarm often clusters with her under the hive. Colonies with clipped queens usually swarm a bit later in the development cycle of the new queen(s) in the colony. However, they are only delayed by a day or two. I’m afraid the puzzle will remain. The question came from an internet search … unless the person who posed it reads this and responds all we can do is speculate. 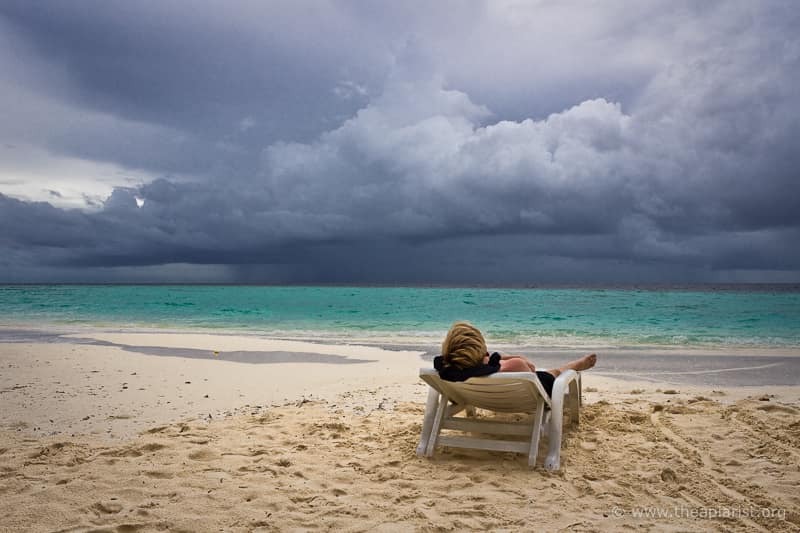 † Or perhaps to establish themselves in your neighbours soffits. The same neighbour who has always complained about your bees chasing their dog and stinging their children. Reason enough to try and not lose swarms. This entry was posted in Beekeeping, Swarms and tagged cast, Google, mated queen, swarm, swarms, Ted Hooper, virgin queen on June 16, 2017 by David.